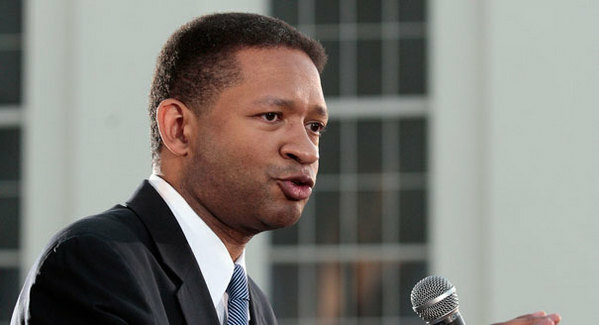 BRISTOW, Va. -- Four summers ago, then-Democratic Rep. Artur Davis of Alabama delivered a nominating speech in support of Barack Obama. The Illinois senator's election as party standard-bearer “takes us closer to becoming what we know America can be," he said at the Denver convention. But times have changed in the intervening years -- especially for Davis himself. Now a Virginia Republican, he spent part of Thursday afternoon at the home of a Northern Virginia family talking about how Obama failed the country on the economy, and how he believes presumptive GOP nominee Mitt Romney is best equipped to revive it. And he doesn’t rule out attending the Republican convention in Tampa. Davis, who lost the Democratic primary for Alabama governor two years ago, announced his party switch in May, and even expressed interest in returning to Congress as an Old Dominion Republican. In a note announcing his departure from the party, he suggested that Obama’s presidency was long on symbolism but short on substance. But even before he officially made the switch, Davis had been critical of the president, about whom he once spoke enthusiastically. And he had also expressed support for voter ID laws, which earned the ire of Democratic colleagues. Thursday marked the second of Davis’ appearances on behalf of Romney this cycle. Last week, he attended the opening of a Republican Party office in Bristow. “We’re thrilled to have Congressman Davis’ support, and we look forward to working with him in the coming weeks and months to ensure Gov. Romney wins Virginia and America elects a president who will put jobs -- not job-killing policies -- first,” said Curt Cashour, Romney’s Virginia communications director. In many ways, Davis is an ideal surrogate for the campaign: An African-American who was once considered a rising star of the Democratic Party and who co-chaired Obama’s 2008 campaign, Davis is able to speak personally about gravitating towards and then feeling let down by the Obama rhetoric of four years ago. Indeed, a conservative super PAC recently launched an anti-Obama campaign bearing the essentially the same message. Davis indicated that his ability to focus attention on the national debt is his chief asset to the GOP. At the event here Thursday -- which consisted of Davis, College Republican National Committee Chairman Alex Schriver, the Dauberts and a couple of reporters -- Davis said the Democratic Party isn’t serious about deficit reduction.